Streetscape and safety improvements at Catalytic Site 2 in South Salt Lake (2100 S to Haven Ave). The State Street community of businesses, residents, travellers and visitors are invited to comment on the proposed plans for the future of this neighborhood and the street. 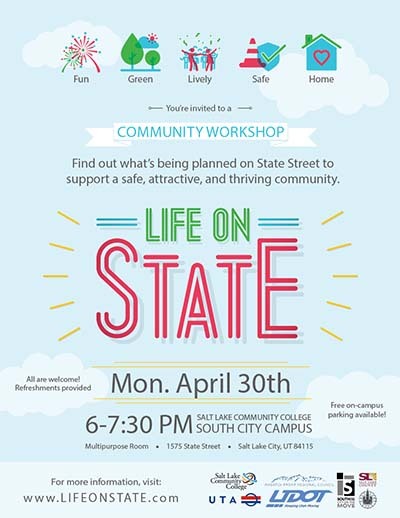 A public workshop is being hosted by Salt Lake Community College on Monday, April 30, 2018 from 6:00-7:30 pm. It is free and open to all. Parking is free and refreshements will be served. Facilitators will guide participants through discussions of the plans and help attendees find ways to call for action on the corridor. Close to 200 people joined forces on February 9th to talk about what could make State Street a better place for everyone who lives, works, shops or moves along it. The workshop was the kickoff for the Life on State project, which is a plan for improving transportation, business, housing and the character of this historically important street. Many people today often think of State Street as a place that isn’t safe or inviting to visit. Cars and trucks travel fast and often don’t stop for people who are trying to cross the street. There are many vacant lots, parking lots or empty storefronts. Yet, the neighborhood is one of the last affordable places to live or do business in the valley. Many people pointed out ways to give it a boost to make it more of a neighborhood. Residents, business owners and community leaders spent time at the workshop drawing on maps and designing an ideal street that would be more friendly to walkers, bikers, and shoppers while still keeping the cars moving. In the coming weeks, the project team will be compiling and analyzing feedback from the workshop to prepare alternative scenarios and evaluate the potential impacts different futures could have on key issues important to the public. Sign up to receive the latest developments and updates about public events.